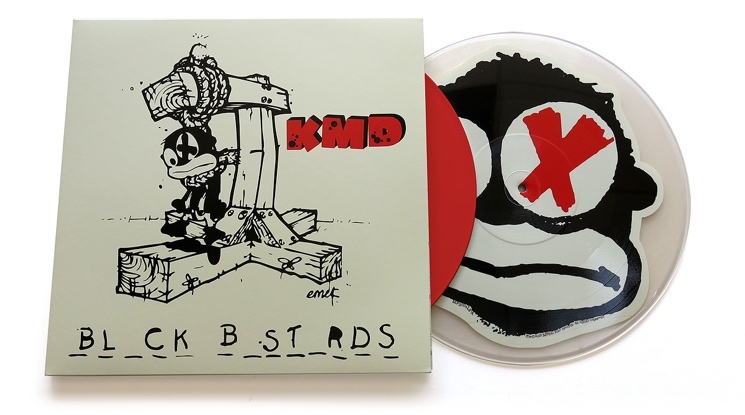 Record Store Day is usually reserved for vinyl, but this past April, KMD's legendary lost album Black Bastards was reissued as a unique CD box with children's pop-up book packaging. Next, that album from DOOM's old group is set to get a lavish vinyl pressing. It's due out September 14 through Metal Face Records. While this isn't the album's first vinyl pressing, it is the fanciest: the album is split across two records, one of them red and the other one a picture disc showing the character from the album cover. This all comes with a 32-page booklet and is housed in a pop-up-style gatefold sleeve. Hopefully the label knows what it's getting into with the pop-up sleeve; earlier this year, Sub Pop had to issue replacement LPs after Father John Misty's pop-up art resulted in warped vinyl. The previous vinyl pressing for Black Bastards was in 2008. Copies aren't easy to come by, however, and they can fetch triple digits through online retailers. KMD famously features rapper/producer Zev Love X, real name Daniel Dumile, who went on to become MF Doom/DOOM. The group initially recorded Black Bastards in 1993, but Elektra scrapped it (allegedly because of the controversial artwork), and it went unreleased until 2000.